Fill a large pot about 2/3 full of water. Add 2 tablespoons salt or olive oil, cover and bring to a boil over high heat. Slide the pasta into the boiling water, stir. Cook pasta about 6 minutes for al dente linguine or 3 minutes for fresh made pasta. Over medium-high heat in a large skillet, spoon 2 tablespoons of the garlic oil mojo. Pat the shrimp dry; when the oil is hot, place them in the skillet. Cook until the shrimp are no longer pink in the center, about 1 minute per side. Remove the skillet from the heat and stir in the chopped chills and the reserved mojo. Remove ½ cup of the pasta water; drain pasta into a colander. Return pasta and the ½ cup water to the pot. Scrape in the shrimp mixture, sprinkle with the chopped cilantro, toss together and divide among warm plates. Sprinkle with the grated cheese and serve. Peel away paper shell from garlic gloves. Next stir together the garlic and oil in an 8×8-inch baking pan (make sure all the garlic is submerged), slide it into the oven and bake until the garlic is soft and lightly brown, about 45 to 55 minutes. Add the lemon juice and return to the oven for 20 minutes for the garlic to absorb the juice and turn golden brown. 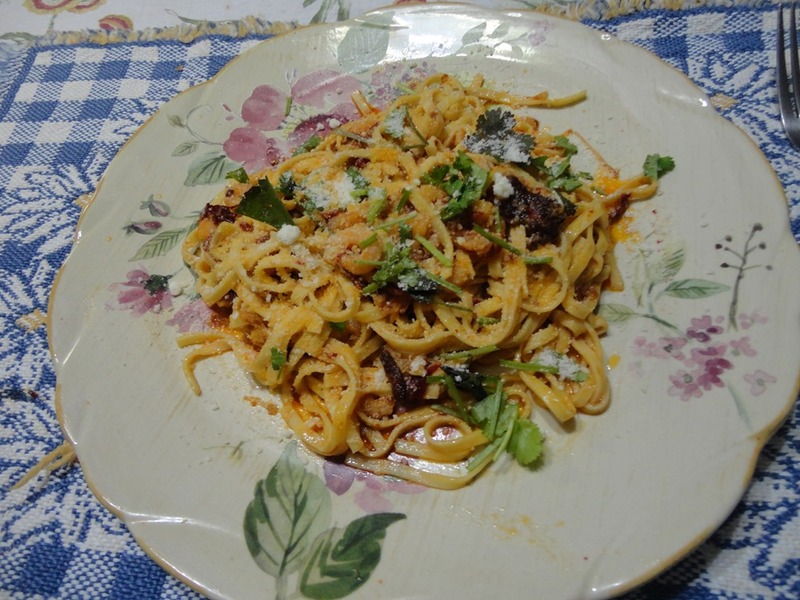 This entry was posted in Main Dish and tagged Condiments, Cook, Garlic, Home, Olive oil, Parmigiano-Reggiano, Pasta, Shrimp. Bookmark the permalink.